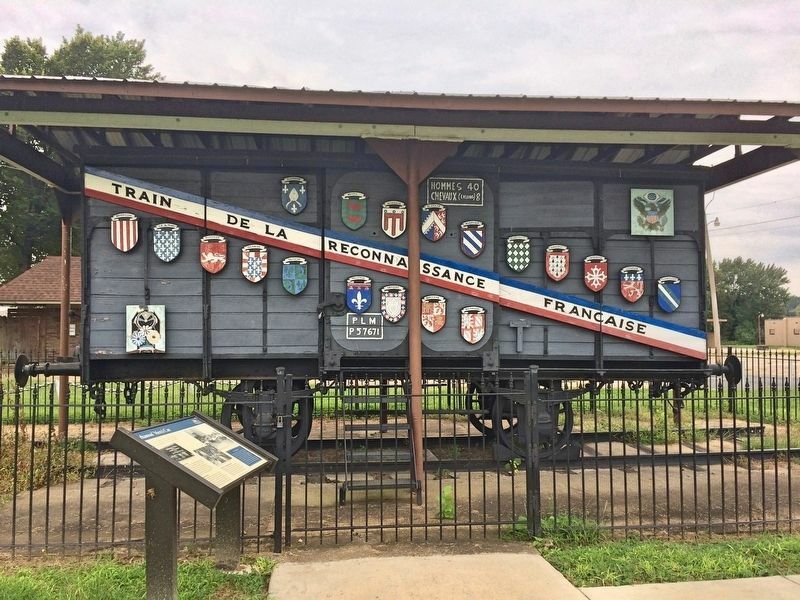 This boxcar and the gifts it carried are a reminder of American support of France during two world wars, and of France's gratitude for that support. Such gestures between peoples deserve a lasting place in our memories. In 1947, the people of the United States sent 700 boxcars of food, medicine, fuel and clothing to a France devastated by years of Nazi occupation. The Friendship Train was a grassroots effort; it received no government support. 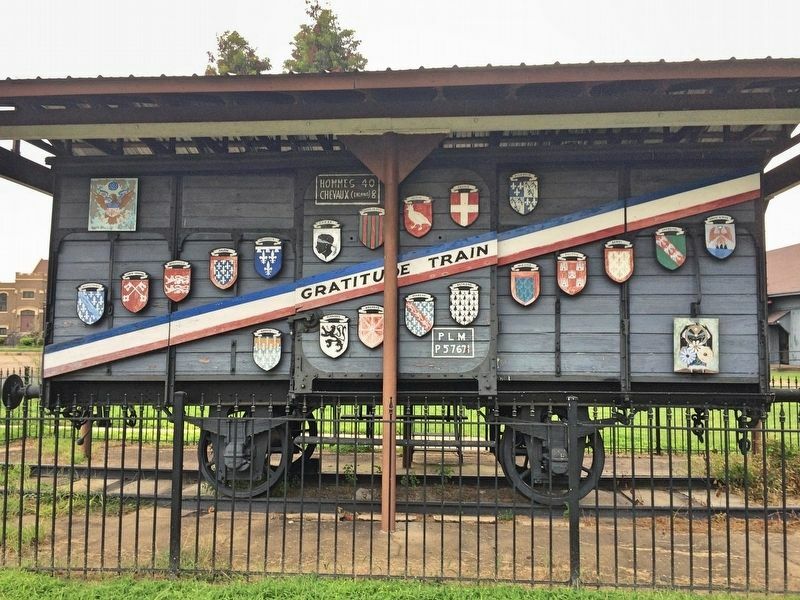 In 1949, the people of France expressed their thanks by sending a Mercí Train—a Gratitude Train—to America. Shields representing the provinces of France decorated each of the forty-nine boxcars loaded with gifts. The Mercí Car toured the state before arriving at the Shumaker Naval Ordnance Depot in Camden. In January 1961, the boxcar was moved to Helena, home of the then-department commander of the American Legion in Arkansas. The gifts the train carried are now in the collections of several museums and state universities. The Mercí Train's boxcars were antiques, built between 1875 and 1882. During World War I (1914-1918) and World War II (1939-1945) armies used the wooden boxcars to transport men and horses to and from the battlefront. The men called them Forty and Eights, in French Hommes 40 Chevaux (en long) 8, because each car held forty men or eight horses. Many French and American veterans remembered spending days in these boxcars, which had no seats, windows or toilets. Soldiers barely had enough space to sit down and had to lie down in rows to sleep. Top left: The people of Arkansas contributed five boxcars of food to the Friendship Train. Middle: Thousands of people came out to see the gifts the French sent to the people of Arkansas. their homes to the people of America. Above are some of the gifts sent to Arkansas. Marker series. This marker is included in the Merci Train Boxcars marker series. Location. 34° 31.652′ N, 90° 35.299′ W. Marker is in Helena, Arkansas, in Phillips County. Marker is on Pecan Street south of Porter Street, on the left when traveling south. Touch for map. 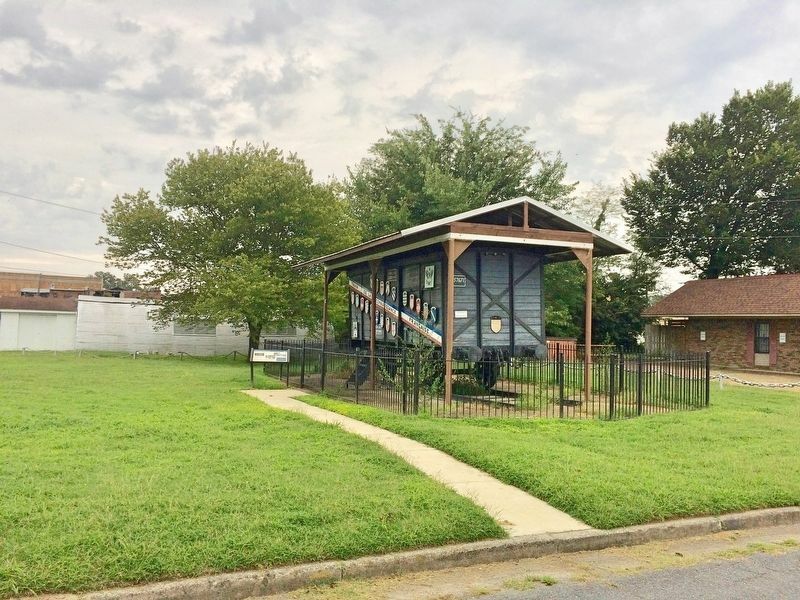 Marker is at or near this postal address: 504 Pecan Street, Helena AR 72342, United States of America. Touch for directions. Other nearby markers. At least 8 other markers are within walking distance of this marker. The T-33 Shooting Star (within shouting distance of this marker); The American Legion Hut (within shouting distance of this marker); The Irish Immigrant (about 400 feet away, measured in a direct line); Patrick Cleburne in Helena (about 400 feet away); General Patrick Cleburne (about 400 feet away); Phillips County's Confederate Soldiers (about 400 feet away); Seven Confederate Generals (about 400 feet away); Civil War Comes to Arkansas (about 400 feet away). Touch for a list and map of all markers in Helena. 5. 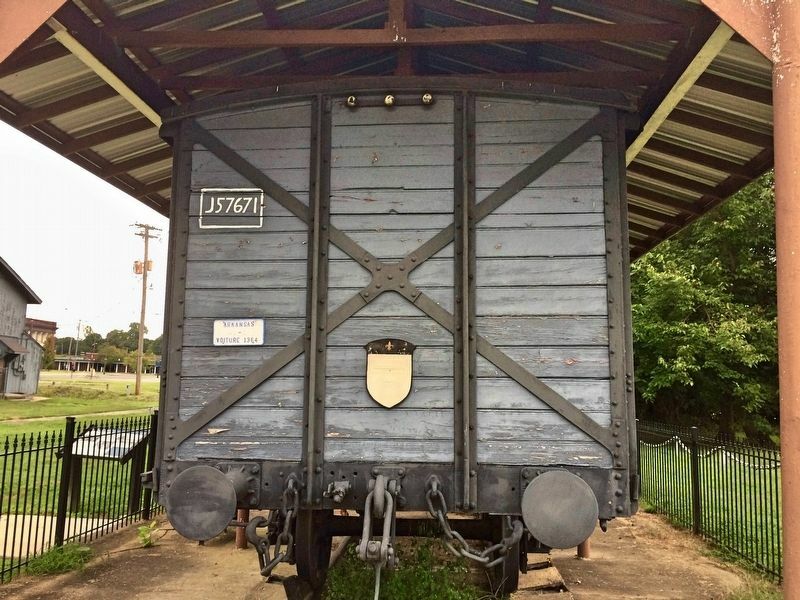 Arkansas' Mercí Train car at the American Legion Hut. More. 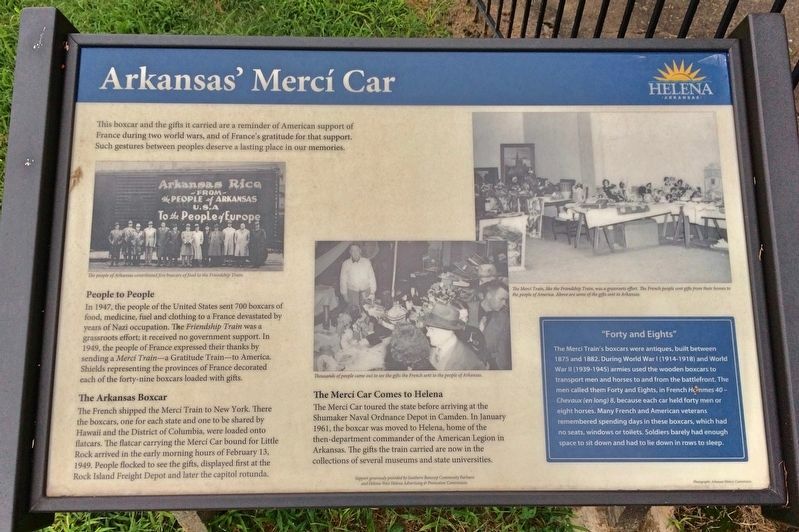 Search the internet for Arkansas' Mercí Car. Credits. This page was last revised on September 1, 2017. This page originally submitted on September 1, 2017, by Mark Hilton of Montgomery, Alabama. This page has been viewed 136 times since then and 7 times this year. Photos: 1, 2, 3, 4, 5. submitted on September 1, 2017, by Mark Hilton of Montgomery, Alabama.